Recent statistics have suggested that only 30% of marketers test their emails frequently, and in extreme cases even important tests, such as spam checking, are left out altogether. Testing should form an integral part of any email marketing campaign as it helps to create and protect revenue. 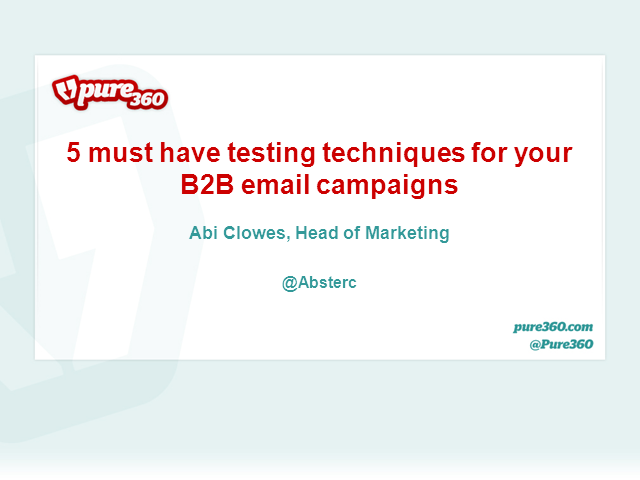 In this webinar Abi Clowes, Head of Marketing at Pure360, will cover 5 must have testing techniques for your B2B email campaigns including inbox preview testing, how to ensure you get your subject line right, perfecting a landing page and removing human errors. This is an unmissable webinar for any B2B marketer who wants to ensure they’re getting the best possible results from their email marketing campaigns.